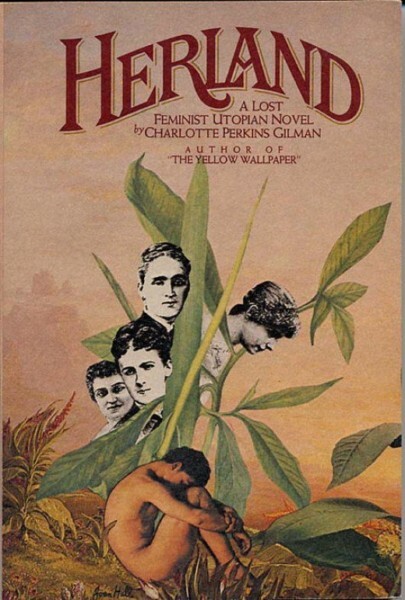 Herland is a utopian novel, in which three young male explorers discover a hidden land populated only by women who have reproduced without the need of men for thousands of years. Most of the novel is a description of the ideal systems of the society they have developed. It is funnily caricatural in the male characters, one is the archetypal macho and the other a hopeless romantic who idolizes women, and the narrator who is a sociologist poses it seems as the ideal male attitude : curious and attentive, learning as much as he can from these superior females. It must be mentioned that as in many of her writings, some clearly racist remarks can be found when she speaks about the “superiority of race” of the people of this utopian land, and it has been argued that this unmistakable aspect of her writings should disqualify her from the ranks of feminism entirely, while others are willing to consider the time and context the writer belonged to, and not to throw the baby with the bathwater. 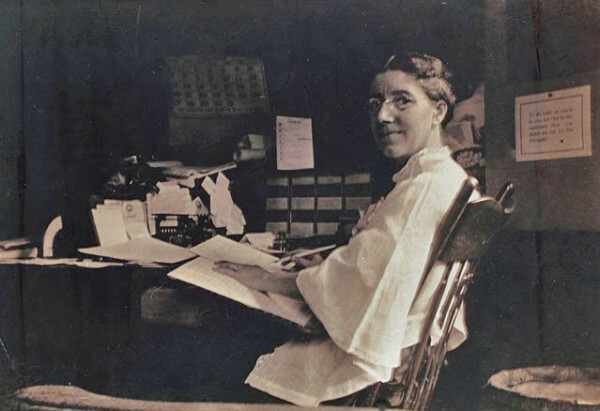 Charlotte Perkins Gilman is also the author of the famous short story “The Yellow Wallpaper” which is a feminist milestone dealing with depression and schizophrenia. Uploaded here is a chapter that describes, after some introduction, the system of education of Herland, which seemed worth sharing. “But a mother’s love–” I ventured. They had faced the problems of education and so solved them that their children grew up as naturally as young trees; learning through every sense; taught continuously but unconsciously– never knowing they were being educated. But the babies and little children never felt the pressure of that “forcible feeding” of the mind that we call “education.” Of this, more later. What I'm trying to show here is that with these women the whole relationship of life counted in a glad, eager growing-up to join the ranks of workers in the line best loved; a deep, tender reverence for one's own mother—too deep for them to speak of freely—and beyond that, the whole, free, wide range of sisterhood, the splendid service of the country, and friendships. But when we began to talk about each couple having "homes" of our own, they could not understand it. "Our work takes us all around the country," explained Celis. "We cannot live in one place all the time." "It's not the same thing at all," he insisted. "A man wants a home of his own, with his wife and family in it." "Staying in it? All the time?" asked Ellador. "Not imprisoned, surely!" "Of course not! Living there—naturally," he answered. "What does she do there—all the time?" Alima demanded. "What is her work?" "But what do they do—if they have no work?" she persisted. "They take care of the home—and the children." "Why yes. The children play about, and the mother has charge of it all. There are servants, of course." "How many children do your women have?" Alima had her notebook out now, and a rather firm set of lip. Terry began to dodge. "There is no set number, my dear," he explained. "Some have more, some have less." "There!" triumphed Alima. "One or two or no children, and three or four servants. Now what do those women DO?" We explained as best we might. We talked of "social duties," disingenuously banking on their not interpreting the words as we did; we talked of hospitality, entertainment, and various "interests." All the time we knew that to these large-minded women whose whole mental outlook was so collective, the limitations of a wholly personal life were inconceivable. "We cannot really understand it," Ellador concluded. "We are only half a people. We have our woman-ways and they have their man-ways and their both-ways. We have worked out a system of living which is, of course, limited. They must have a broader, richer, better one. I should like to see it." "There's nothing to smoke," complained Terry. He was in the midst of a prolonged quarrel with Alima, and needed a sedative. "There's nothing to drink. These blessed women have no pleasant vices. I wish we could get out of here!" This wish was vain. We were always under a certain degree of watchfulness. When Terry burst forth to tramp the streets at night he always found a "Colonel" here or there; and when, on an occasion of fierce though temporary despair, he had plunged to the cliff edge with some vague view to escape, he found several of them close by. We were free—but there was a string to it. "Wish they had!" Terry persisted. "They've neither the vices of men, nor the virtues of women—they're neuters!" "You know better than that. Don't talk nonsense," said I, severely. I was thinking of Ellador's eyes when they gave me a certain look, a look she did not at all realize. Jeff was equally incensed. "I don't know what 'virtues of women' you miss. Seems to me they have all of them." "They've no modesty," snapped Terry. "No patience, no submissiveness, none of that natural yielding which is woman's greatest charm." I shook my head pityingly. "Go and apologize and make friends again, Terry. You've got a grouch, that's all. These women have the virtue of humanity, with less of its faults than any folks I ever saw. As for patience—they'd have pitched us over the cliffs the first day we lit among 'em, if they hadn't that." "There are no—distractions," he grumbled. "Nowhere a man can go and cut loose a bit. It's an everlasting parlor and nursery." "and workshop," I added. "And school, and office, and laboratory, and studio, and theater, and—home." "There isn't anything else, and you know it," Jeff retorted hotly. "I never saw, I never dreamed of, such universal peace and good will and mutual affection." "Oh, well, of course, if you like a perpetual Sunday school, it's all very well. But I like Something Doing. Here it's all done." "Life is a struggle, has to be," he insisted. "If there is no struggle, there is no life—that's all." "You're talking nonsense—masculine nonsense," the peaceful Jeff replied. He was certainly a warm defender of Herland. "Ants don't raise their myriads by a struggle, do they? Or the bees?" "Oh, if you go back to insects—and want to live in an anthill—! I tell you the higher grades of life are reached only through struggle—combat. There's no Drama here. Look at their plays! They make me sick." I see I have said little about the economics of the place; it should have come before, but I'll go on about the drama now. While Terry and Alima struck sparks and parted—he always madly drawn to her and she to him—she must have been, or she'd never have stood the way he behaved—Ellador and I had already a deep, restful feeling, as if we'd always had one another. Jeff and Celis were happy; there was no question of that; but it didn't seem to me as if they had the good times we did. Well, here is the Herland child facing life—as Ellador tried to show it to me. From the first memory, they knew Peace, Beauty, Order, Safety, Love, Wisdom, Justice, Patience, and Plenty. By "plenty" I mean that the babies grew up in an environment which met their needs, just as young fawns might grow up in dewy forest glades and brook-fed meadows. And they enjoyed it as frankly and utterly as the fawns would. "Everybody congratulated me. The children all over the country were told to watch for that moth, if there were any more. I was shown the history of the creature, and an account of the damage it used to do and of how long and hard our foremothers had worked to save that tree for us. I grew a foot, it seemed to me, and determined then and there to be a forester." We have two life cycles: the man's and the woman's. To the man there is growth, struggle, conquest, the establishment of his family, and as much further success in gain or ambition as he can achieve. To the woman, growth, the securing of a husband, the subordinate activities of family life, and afterward such "social" or charitable interests as her position allows. What Terry meant by saying they had no "modesty" was that this great life-view had no shady places; they had a high sense of personal decorum, but no shame—no knowledge of anything to be ashamed of. Even their shortcomings and misdeeds in childhood never were presented to them as sins; merely as errors and misplays— as in a game. Some of them, who were palpably less agreeable than others or who had a real weakness or fault, were treated with cheerful allowance, as a friendly group at whist would treat a poor player. To sit in one of their nurseries for a day was to change one's views forever as to babyhood. The youngest ones, rosy fatlings in their mothers' arms, or sleeping lightly in the flower-sweet air, seemed natural enough, save that they never cried. I never heard a child cry in Herland, save once or twice at a bad fall; and then people ran to help, as we would at a scream of agony from a grown person. As for the babies—a group of those naked darlings playing on short velvet grass, clean-swept; or rugs as soft; or in shallow pools of bright water; tumbling over with bubbling joyous baby laughter— it was a view of infant happiness such as I had never dreamed. It was all theirs, waiting for them to learn, to love, to use, to serve; as our own little boys plan to be "a big soldier," or "a cowboy," or whatever pleases their fancy; and our little girls plan for the kind of home they mean to have, or how many children; these planned, freely and gaily with much happy chattering, of what they would do for the country when they were grown. It was the eager happiness of the children and young people which first made me see the folly of that common notion of ours —that if life was smooth and happy, people would not enjoy it. As I studied these youngsters, vigorous, joyous, eager little creatures, and their voracious appetite for life, it shook my previous ideas so thoroughly that they have never been re-established. The steady level of good health gave them all that natural stimulus we used to call "animal spirits"—an odd contradiction in terms. They found themselves in an immediate environment which was agreeable and interesting, and before them stretched the years of learning and discovery, the fascinating, endless process of education. "I want a chapter of explanation," I told her. "You know my stupidities by heart, and I do not want to show them to Ellador —she thinks me so wise!" She smiled delightedly. "It is beautiful to see," she told me, "this new wonderful love between you. The whole country is interested, you know—how can we help it!" I had not thought of that. We say: "All the world loves a lover," but to have a couple of million people watching one's courtship—and that a difficult one—was rather embarrassing. "Tell me about your theory of education," I said. "Make it short and easy. And, to show you what puzzles me, I'll tell you that in our theory great stress is laid on the forced exertion of the child's mind; we think it is good for him to overcome obstacles." "Of course it is," she unexpectedly agreed. "All our children do that—they love to." "Our theory is this," she went on carefully. "Here is a young human being. The mind is as natural a thing as the body, a thing that grows, a thing to use and enjoy. We seek to nourish, to stimulate, to exercise the mind of a child as we do the body. There are the two main divisions in education—you have those of course?—the things it is necessary to know, and the things it is necessary to do." "Yes. Our general plan is this: In the matter of feeding the mind, of furnishing information, we use our best powers to meet the natural appetite of a healthy young brain; not to overfeed it, to provide such amount and variety of impressions as seem most welcome to each child. That is the easiest part. The other division is in arranging a properly graduated series of exercises which will best develop each mind; the common faculties we all have, and most carefully, the especial faculties some of us have. You do this also, do you not?" "In a way," I said rather lamely. "We have not so subtle and highly developed a system as you, not approaching it; but tell me more. As to the information—how do you manage? It appears that all of you know pretty much everything—is that right?" This she laughingly disclaimed. "By no means. We are, as you soon found out, extremely limited in knowledge. I wish you could realize what a ferment the country is in over the new things you have told us; the passionate eagerness among thousands of us to go to your country and learn—learn—learn! But what we do know is readily divisible into common knowledge and special knowledge. The common knowledge we have long since learned to feed into the minds of our little ones with no waste of time or strength; the special knowledge is open to all, as they desire it. Some of us specialize in one line only. But most take up several —some for their regular work, some to grow with." "Yes. When one settles too close in one kind of work there is a tendency to atrophy in the disused portions of the brain. We like to keep on learning, always." "As much as we know of the different sciences. We have, within our limits, a good deal of knowledge of anatomy, physiology, nutrition—all that pertains to a full and beautiful personal life. We have our botany and chemistry, and so on—very rudimentary, but interesting; our own history, with its accumulating psychology." "You put psychology with history—not with personal life?" "Of course. It is ours; it is among and between us, and it changes with the succeeding and improving generations. We are at work, slowly and carefully, developing our whole people along these lines. It is glorious work—splendid! To see the thousands of babies improving, showing stronger clearer minds, sweeter dispositions, higher capacities— don't you find it so in your country?" "We try most earnestly for two powers," Somel continued. "The two that seem to us basically necessary for all noble life: a clear, far-reaching judgment, and a strong well-used will. We spend our best efforts, all through childhood and youth, in developing these faculties, individual judgment and will." "Exactly. As the most valuable part. With the babies, as you may have noticed, we first provide an environment which feeds the mind without tiring it; all manner of simple and interesting things to do, as soon as they are old enough to do them; physical properties, of course, come first. But as early as possible, going very carefully, not to tax the mind, we provide choices, simple choices, with very obvious causes and consequences. You've noticed the games?" I had. The children seemed always playing something; or else, sometimes, engaged in peaceful researches of their own. I had wondered at first when they went to school, but soon found that they never did— to their knowledge. It was all education but no schooling. "We have been working for some sixteen hundred years, devising better and better games for children," continued Somel. I sat aghast. "Devising games?" I protested. "Making up new ones, you mean?" Then I remembered the kindergarten, and the "material" devised by Signora Montessori, and guardedly replied: "To some extent." But most of our games, I told her, were very old—came down from child to child, along the ages, from the remote past. "And what is their effect?" she asked. "Do they develop the faculties you wish to encourage?" Again I remembered the claims made by the advocates of "sports," and again replied guardedly that that was, in part, the theory. "But do the children LIKE it?" I asked. "Having things made up and set before them that way? Don't they want the old games?" "You can see the children," she answered. "Are yours more contented—more interested—happier?" Then I thought, as in truth I never had thought before, of the dull, bored children I had seen, whining; "What can I do now? "; of the little groups and gangs hanging about; of the value of some one strong spirit who possessed initiative and would "start something"; of the children's parties and the onerous duties of the older people set to "amuse the children"; also of that troubled ocean of misdirected activity we call "mischief," the foolish, destructive, sometimes evil things done by unoccupied children. The houses and gardens planned for babies had in them nothing to hurt—no stairs, no corners, no small loose objects to swallow, no fire—just a babies' paradise. They were taught, as rapidly as feasible, to use and control their own bodies, and never did I see such sure-footed, steady-handed, clear-headed little things. It was a joy to watch a row of toddlers learning to walk, not only on a level floor, but, a little later, on a sort of rubber rail raised an inch or two above the soft turf or heavy rugs, and falling off with shrieks of infant joy, to rush back to the end of the line and try again. Surely we have noticed how children love to get up on something and walk along it! But we have never thought to provide that simple and inexhaustible form of amusement and physical education for the young.